For people with severe food allergies, eating any packaged food can be dangerous. Even if an allergen doesn’t appear on the ingredients list, there is a chance of cross-contamination from other products made in the same facility. There is no easy way to tell for sure whether a certain item contains the substances to which you’re allergic. Design school graduate Sebastian Goudsmit built his graduation project around the goal of helping people with food allergies stay safe. 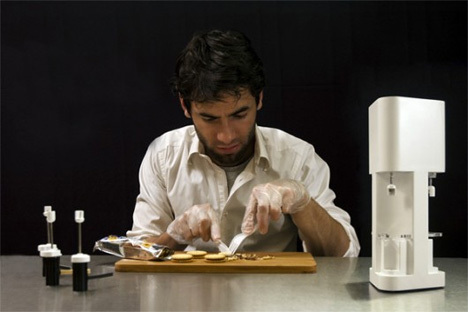 He developed the Allergen Beagle, a simple in-home gadget that can detect the presence of peanuts, hazelnuts, gluten, shellfish, lactose, soy, egg, sesame and almonds. The device seems easy enough to use. 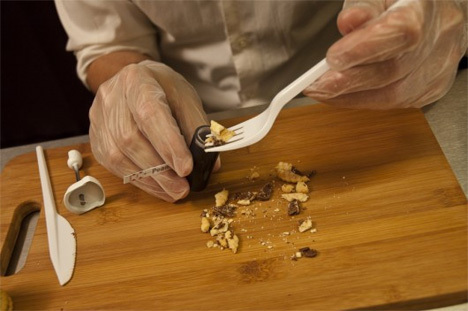 You put a small sample of the food you want to test into the appropriate test tube (there’s one for each allergen). Then you put the tube(s) into the Allergen Beagle machine, switch it on and a test strip tells you if the selected allergen is present. 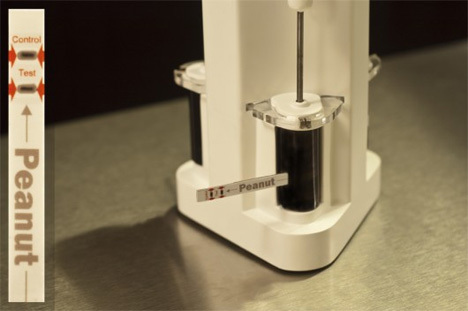 Goudsmit hopes to continue development of the device so that it can test for a wider range of substances. If the Allergen Beagle is produced and the price point is low enough for the average allergy sufferer, it could help to prevent tons of medical emergencies and plenty of patient discomfort and fear. See more in Home & Personal or under Gadgets. November, 2011.